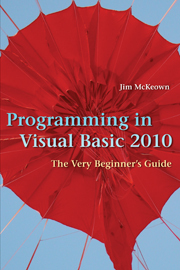 This book is an introduction to programming using Microsoft's Visual Basic .NET 2010. It is intended for novice programmers with little or no programming experience or no experience with Visual Basic. The text emphasizes programming logic and good programming techniques with generous explanations of programming concepts written from a nontechnical point of view. It stresses input, processing, and output and sequence, selection, and repetition in code development. File input and output (I/O) and arrays are included. Later chapters introduce objects, event programming, and databases. By taking a slow and steady approach to programming ideas, this book builds new concepts from what the reader has already learned. VB tips and quips inject both humor and insight. The accompanying web site has code downloads, I/O, and database files from small, simple files to large files with thousands of records, flowcharts, deskchecks, and audits to aid with program design, coding, and debugging, PowerPoint files for every chapter, and hundreds of ideas for programs and projects. Dr. Jim McKeown has spent more than 20 years at Dakota State University, where he is an Assistant Professor. He currently teaches programming, computer hardware, software testing, and computer applications. He received a master's degree in computer education from Columbia University and holds a Ph.D. in instructional design from the University of Iowa. He has contributed several articles to the Journal for Computing in Small Colleges as well as various other publications. Quick, who won the Academy Award for Best Screenplay last year? Who won a Grammy last year? Who pitched the last game of the World Series? How often do the rich and famous make headlines for their good work, not their misdeeds? These people don't impact your life so why is society obsessed them? And you certainly don't want to emulate many of them. Look around and find the ones that do impact your life and pay attention to them. Thank you to the reviewers. Without their hard and sometimes thankless work, this book wouldn't be nearly as good. I especially want to thank Rudy McDaniel for his keen eye and suggestions. Thank you to Mrs. Heneghen, my first grade teacher, who taught me how to read and write and do arithmetic. She was a wonderful lady. Thank you to Mrs. Short. She instilled in me a love of learning I carry to this day. She's still my neighbor and I've never been able to turn her down when she's asked for a favor. Mrs. Pratt taught me multiplication and division, Mrs. Moulton taught me science, and Mrs. Stuefen first taught me geography. I still love doing math in my head, studying science, and poring over maps. Miss Haggerty – there wasn't a boy in the sixth grade that wasn't in love with her. I admired and respected Mr. Skovlund. Mr. Tordoff taught me typing. I still use it every day, but he taught his best lessons with a whistle in his hand. Mrs. Hefling was my English and speech teacher. I can make my living through writing and speaking because of her. Mr. Magnus taught me algebra and physics and always had time to answer questions. He was a good man. Mr. Vincent was my history teacher and coach. His quiet dignity touched students for nearly forty years. He made me a better person. Dr. Jerry Sweeney was my college advisor. He saw something in this skinny farm boy. Thank you to Anne Vollmer, Nancy Cunniff, and Howard Budin in grad school. Thank you to Dr. Jim Maxey. He was a vice president at ACT but still had time to help me with my dissertation. These teachers made a difference in my life and I'll never forget that. To Delores. See? Being a computer geek finally paid off. Now, I can start working on the movie. 9 File I/O – Files and Records and Fields, Oh My!